Washington, Aug 30 (IANS) A devastating storm that swept through the US state of Texas made a second landfall in Louisiana state on Wednesday, dousing the region with heavy rains that officials warned could lead to catastrophic and life-threatening flooding. Five days after roaring onto the Texas coast, leaving behind disastrous flooding and reportedly claiming 30 lives, Harvey, now a tropical storm, made landfall early in the morning near tiny Cameron in Louisiana. Forecasters said another five to 10 inches of rain could fall in western Louisiana, where rivers and bayous were already swollen with near-record downpours, the Washington Post reported. The storm is expected to bring winds of 30-40 mph and a 2-4 foot storm surge along the Louisiana-Texas border, the report said. Harvey’s immediate effects were not expected as devastating as a Category 4 hurricane that first blasted Houston and other parts of Texas beginning on Friday. 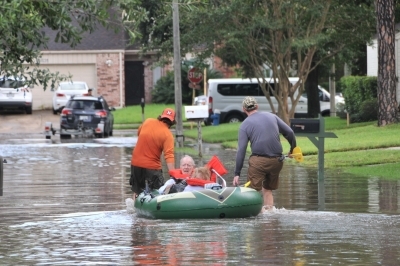 But the National Weather Service (NWS) said that “catastrophic and life-threatening flooding will continue in and around Houston eastward into southwest Louisiana for the rest of the week”. As Harvey approached, storm-battered Louisiana — where memories of Hurricane Katrina, which made landfall in the state 12 years ago, are still fresh — hunkered down, evacuating hundreds of people and deploying the Louisiana National Guard. Louisiana beefed up emergency resources, doubling up on high water vehicles, boats and helicopters on duty. Governor John Bel Edwards urged people to “prepare and pray”. Flash flood warnings were issued across eastern Texas and western Louisiana. 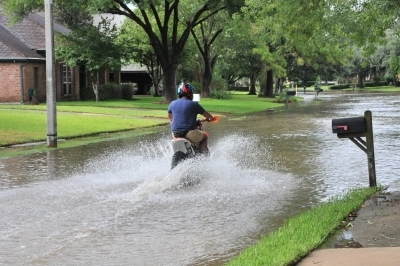 The rainfall in Texas set a new record for the continental US, the NWS said on Tuesday. A rain gauge in Cedar Bayou recorded nearly 52 inches of rain since Friday. Houston Mayor Sylvester Turner imposed a curfew in the city starting Tuesday from midnight to 5 a.m. to deter looting of abandoned homes. President Donald Trump visited Texas on Tuesday to survey the damage brought by Harvey. He arrived in Corpus Christi, where Hurricane Harvey first made landfall on Friday, with First Lady Melania Trump. The President will not be visiting Houston, said the White House as he did not want his visit to disrupt the emergency response. Trump has declared a federal state of emergency in both Texas and Louisiana. The move releases emergency government funding and other assistance.